27-May-2007 -- On a short visit to Mexico I was surprised to see that about 50 land confluences points are still unvisited. What happened to the sense of adventure for all those eager US confluence hunters? Many of them are within a day's drive of the border - others may require a day/weekend trip from Mexico City or other airport. Last weekend I decided to have a go at 20N 99W - but didn't read the narrative of the previous visit and we were always the wrong side of the hill or at the top of the wrong hill - anyway maybe I will have another go at it before we leave but this weekend I decided to have a go at a new one. The choice was quite wide but I didn't have time for too much mountain climbing or driving on small roads for hours so I opted for this one - it was a long way from Mexico City (1000km round trip)but it was an the flat and unless there were big fences I thought it should be possible. This time I bought a map - always helpful! and I had the satellite image for local roads. I hired a car from the airport and headed east - the mood was soured a little at the start by a policeman pouncing at a busy roundabout and demanding 200 USD for leaving my indicator light on too long! He didn't get that much - but did get some unfortunately - he had the gun after all! Mexico City is at 2200 meters and the road quickly climbs over a pass at 3200 meters - quite cool up there! Then it returns to around 2200 meters before plunging down to the coastal plain. Since I only got started at 4pm I had to stop over night at a small town and then drive the final 80km on the next day. Motorways are good in Mexico - quite a lot of trucks and not many cars away from the main cities. They seem to be all toll roads so it may be cheaper to fly to most places. Approaching the point I used the waypoints I had worked out from the satellite picture. This took me along about 15 km of wet dirt roads - the hire car started grey and went back brown! I was expecting a 1.5 km walk but invisible roads took me closer and closer until I finally reached the point - just about 50 metres into a field. Most of the ranches are surrounded by barbed wire and this was no exception but with nobody around and plenty of room under the bottom strand it seemed safe enough. 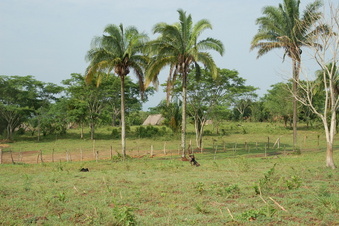 The point is in a patch of rough grazing land which has been cultivated in the past. There are houses within a few hundred meters of the point. After the point I decided to try to leave by a different route - as can be seen from the [track] this led to 2 dead-ends - further study of the satellite picture shows that there is probably a small stream on the north and east sides of the point - enough to stop roads anyway - I was glad I had attacked from the west initially. The return journey was uneventful - I didn't even stop at the local [brewery]! - easier driving in daylight and I just returned the car within the one hour's grace period over the 24 hours. I was comfortably within the period until I just missed the entrance to the airport and it took me 30 minutes to drive around Mexico City until I got back to it - navigating and driving simultaneously is always a challenge and so you end up driving in circles most of the time! Ah well I got my money's worth from National!